Now a century old, Anchorage has at various times during its short history proclaimed itself the “Air Crossroads of the World,” a “City of Lights” and a place of “Big Wild Life” (the latter for the community’s “perfect blend of urbanity and wilderness”). 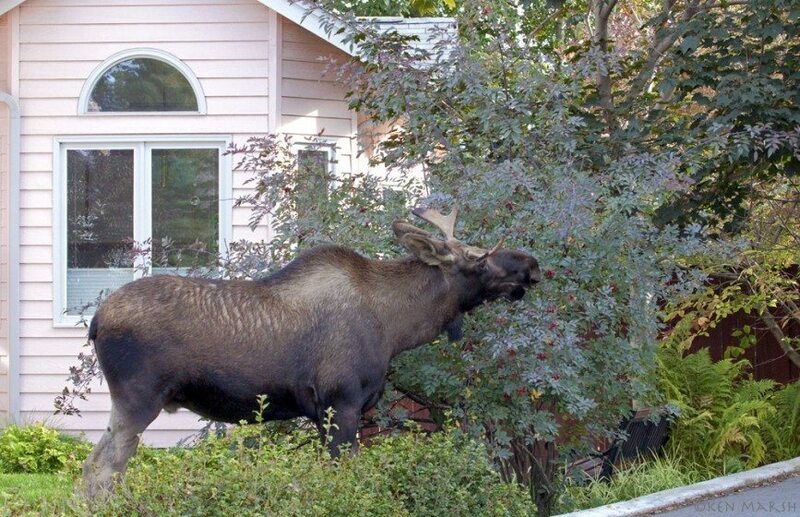 But I have long believed—and yes, opined in my writings—that Alaska’s urban center could easily be called the “City of Moose.” I’m not the only one to publicly express this view. 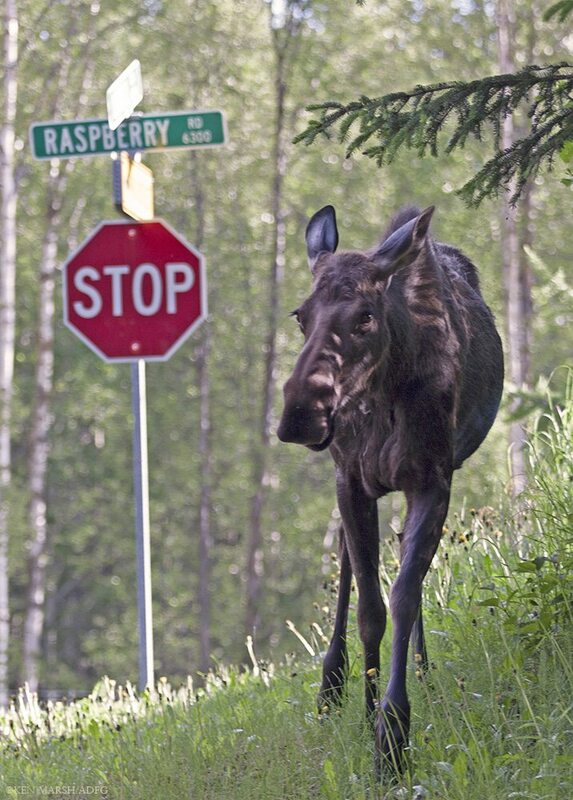 Earlier this year, former state wildlife manager Rick Sinnott, now a contributor to the Alaska Dispatch News, went so far as to write a cover story for the ADN’s Sunday magazine playfully promoting the City of Moose idea. 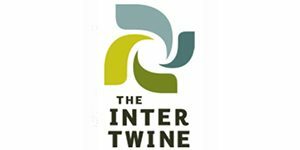 The question of how to weave our urban lives with wild nature is one faced in different forms all around the world. Not only do hundreds of moose inhabit the city’s landscape, most of the 300,000 or so people who live here appreciate the ungulates’ big, wild presence. Clear evidence of that was demonstrated in a study conducted in 2009 for the Alaska Department of Game by a company called Responsive Management. Still, not everyone likes having moose around. Some folks are angered by the animals’ taste for ornamental plants and garden vegetables and would like their numbers thinned. Others, particularly parents with children, understandably worry about the dangers moose present. And a vocal minority argues that cities are for people, period, and moose shouldn’t be allowed here (nor should any other big, wild animals that can inflict injuries be tolerated, most notably bears, or so the argument goes). 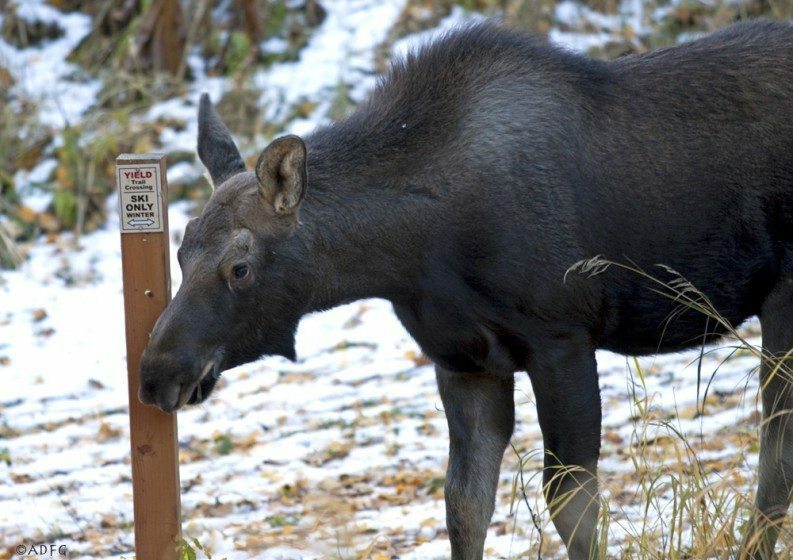 Inevitable conflicts between people and moose, some of which lead to injury or even death, show the challenges of living with wildlife—and, more generally, wild nature—in an urban community, even in a place where most residents feel a close connection to what might be called the “natural world” and where people place great value on outdoors activities. Most of the city’s human residents live in what’s called the “Anchorage Bowl,” a roughly triangular piece of lowland bounded on two sides by the waters of Cook Inlet and on the third by the Chugach Mountains. That bowl is also year-round home to an estimated 200 to 300 moose, with winter numbers tripling, to between 700 and 1,000 animals, when they’re driven out of neighboring hills by deepening snow and lured into the city by Anchorage’s relative abundance of winter food, much of it in the form of fruit-bearing ornamental trees and shrubs. Though their density varies through the year, moose can be found throughout Anchorage in any season, even in the heavily commercialized downtown and midtown areas. In fact, I’d wager that for much of the year there’s no better locale in Alaska to see North America’s largest member of the deer family. Many that inhabit the city prefer the parks, greenbelts and wooded lots of west Anchorage, including the Turnagain area, where I have lived since 2006 after more than a dozen years on the city’s Hillside. One cow moose, often accompanied by a calf or two, inhabits pockets of woods near Anchorage’s much-beloved Coastal Trail, where I regularly walk my dog. Occasionally a bull will amble down the street, munching as he goes. And it’s not rare, especially in winter, to find moose bedded down in either my yard or those of my neighbors. I’ve always felt confident that I could track down an urban moose or two on short notice, if asked to show off the local wildlife by visiting family or friends. That confidence was put to the test when my mother’s two sisters visited us a few years after Mom moved to Alaska from the East Coast in 2002. As their early summer visit wound down, the three sisters agreed they’d had a grand reunion. But neither of my aunts had seen much of the local wildlife. On something of a whim, my girlfriend and I took Mom and one of her sisters on a driving tour of West Anchorage in search of moose (the other sister had earlier headed to the hills east of town with her son, also to seek out moose). About four-five minutes later, we spotted a cow and two yearlings, grazing among a small grove of birches, about 50 yards off the road that leads to Kincaid Park. We parked along the shoulder to watch the animals and within minutes, several other cars pulled over and a dozen murmuring people lined the road, many armed with binoculars, cameras and video recorders. Clearly we weren’t the only moose hunters out that night and I guessed evening expeditions like ours go on throughout the summer. 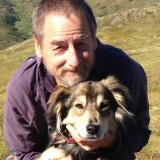 Pleased but not fully satisfied, we headed for a birch-spruce forest near Anchorage’s international airport. Leaving pavement for a dusty gravel road, we slowed to a crawl. Within a few minutes, a young bull appeared in a meadow behind some birch trees. 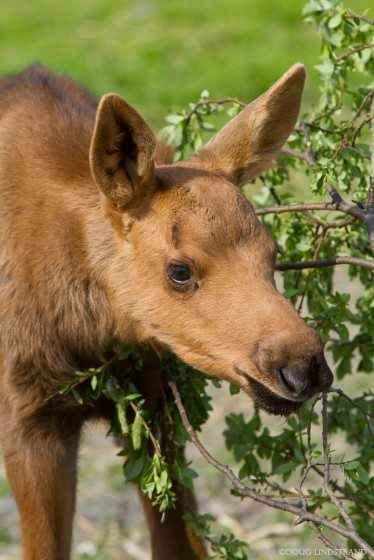 Approaching to within 25 feet of our parked car, the yearling nonchalantly picked leaves from atop a willow. Later we spotted a mature cow browsing among the birches, likely the young bull’s mom. Engine off, we watched silently for several minutes. Both moose gorged on greens, unconcerned by our presence. Nearly 10 pm, with the light dimming, we headed back. Still, we didn’t stop looking. About 5 minutes from home I noticed two shadowy forms beside heavily traveled Northern Lights Boulevard. Little indeed. A tiny, chestnut-colored calf the size of a small pony stood beside its mother in an open, grassy area. We pulled over to the shoulder and, our windows wide open, paused nearby the pair. Because cow moose are notoriously protective of their young, I watched for any signs of upset. But this one showed no evidence of being the least bit agitated. She lifted her head slightly and looked our way, then calmly resumed her grazing. We lingered less than a minute. Then in deepening darkness we finished our tour, more impressed than ever by the city’s abundance of people-tolerant moose. For all the remarkable tolerance they show—especially given our species’ sometimes foolish, stubborn, or mean-spirited behaviors—even urban moose remain wild animals. If pushed too far, or surprised by a close encounter, they’ll sometimes respond aggressively, especially when already stressed by circumstances. Mature bulls, which can weigh 1,000 pounds or more, are nearly as dangerous during the autumn rut, when they stop eating and fight each other for mating rights. The battles can take a substantial toll, leading to exhaustion, injuries, and agitated animals, and what we humans might call short-tempered behavior. 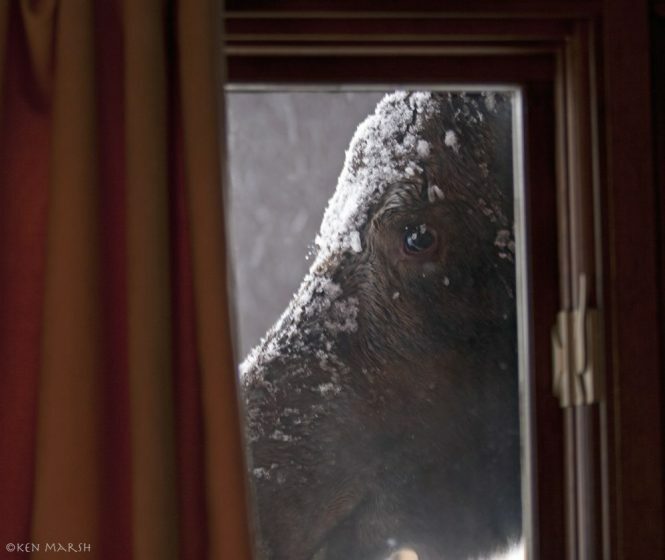 And then there’s winter, when extreme cold or deep-snow conditions may lead to stressed-out moose that sometimes attack a person with little or no apparent provocation. Dogs, of course, add to the stress in all these circumstances, and lots of Anchorage residents have dogs that they take walking, running, biking, skiing, and mushing. Though Anchorage has leash laws, many people allow their dogs off leash when using local trails. Some of those loose dogs end up harassing moose—and in turn are attacked. 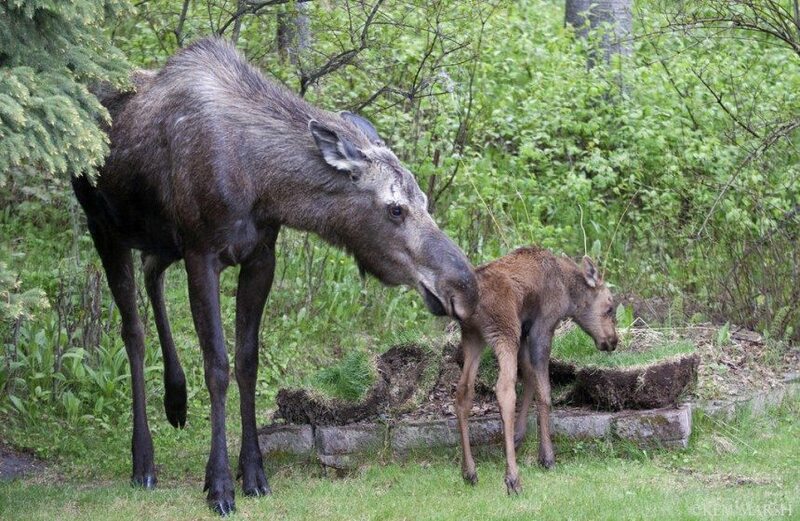 Fish and Game has estimated that moose injure 50 to 100 dogs each year, with a small number killed. In my estimation, it could be a lot worse; from what I’ve observed, in most situations Anchorage moose show remarkable tolerance of dogs as well as people. Injuries to people are uncommon. 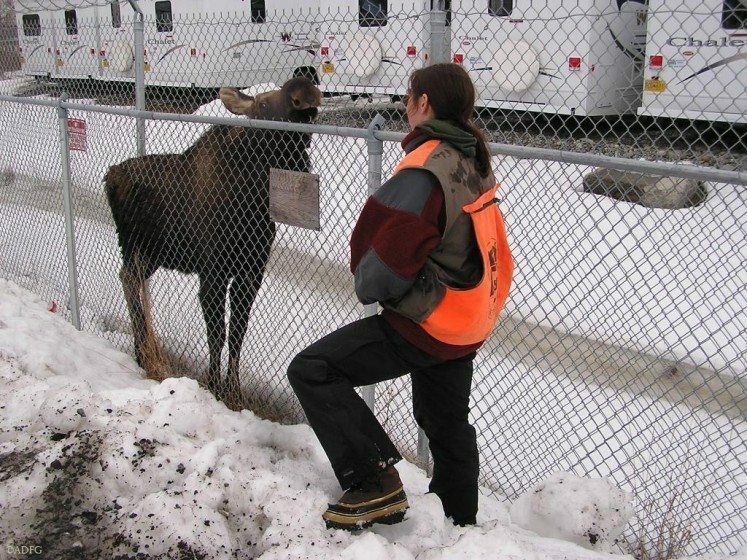 Coltrane, the former wildlife manager, once estimated that moose harm five to ten people each year in the Anchorage area. Rarely are those injuries life threatening. But in 1993 and 1995, Anchorage residents were stomped to death by agitated moose. One fatal wintertime attack was caught on video and made national news when a cow moose with calf, apparently feeling cornered, trampled a man trying to enter a university building. It turned out that the moose had earlier been bombarded by snowballs, no doubt increasing its agitation and defensiveness. Though local media tends to emphasize the dangers of moose attacks, the primary danger that Alces alces presents to people is in moose-vehicle collisions. Alaska, it turns out, has one of the world’s highest rates of moose-vehicle collisions per mile driven. 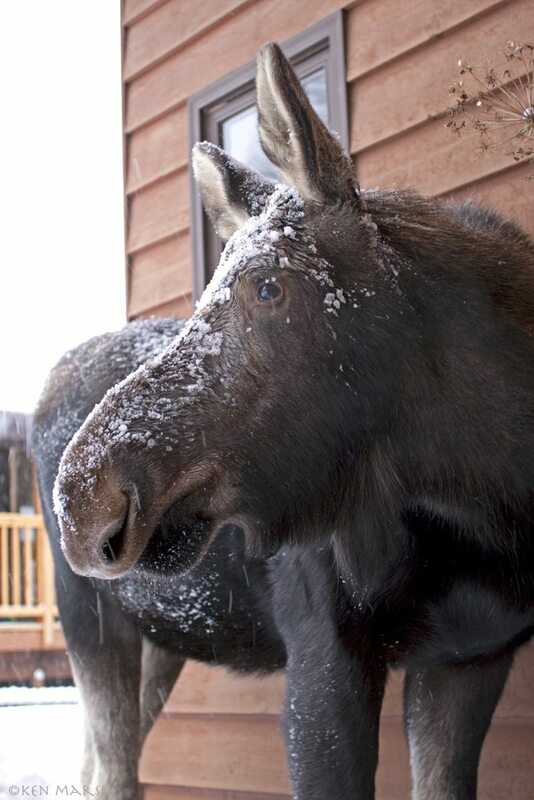 The danger is greatest in winter, when visibility is poorest, streets are often slick with ice and snow, and large snowfalls can prompt moose to seek the relatively easy traveling conditions offered by plowed streets (or packed trails). Besides the winter peak, moose are most frequently hit by cars following the calving season. In Anchorage alone, an average of 150 moose are annually hit by vehicles. Almost always, the moose suffer fatal injuries. 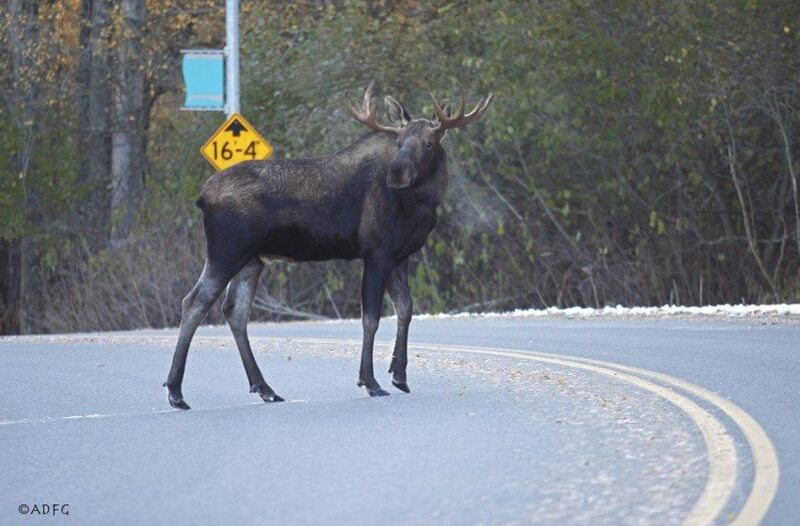 People are rarely killed, though two people died this past October in Anchorage, when on consecutive days their vehicles (one a car, the other a motorcycle) struck moose. More commonly, vehicles are “totaled” and human occupants injured, sometimes seriously. To minimize the danger, the state presents a series of safe-driving tips. Whether they result from stompings or vehicle collisions, moose-caused injuries almost inevitably lead to calls for moose hunts within the Anchorage Bowl. Limited hunts are already allowed on the military’s neighboring Joint Base Elmendorf-Richardson (JBER) and in the Chugach Mountains, but so far there’s been no widespread support for an in-city hunt. The most recent calls for moose hunts in Anchorage proper have been tied to increased recreational use at West Anchorage’s Kincaid Park, most notably single-track biking. A particularly strong push was made in late 2014, when resident Ira Edwards officially proposed a Kincaid moose hunt to the Alaska Board of Game. In a response to Edwards’ proposal and a story about it by Rick Sinnott, I wrote a commentary that explained why a Kincaid moose hunt was an awful idea. Among my main points: rather than “troublemaker” moose, human actions—and especially bad judgment—have largely contributed to the upswing of moose-human conflicts at Kincaid, whether in organized events or other, informal recreational activities. We are supposedly the more intelligent species, yet we sometimes behave in remarkably foolish, ignorant, or stubborn ways. To repeat: the problem at Kincaid Park isn’t trouble-making moose. The animals should not be hunted for public-safety reasons, Edwards’ chief rationale for starting a hunt there. And if a persistently dangerous moose is identified, authorities should remove it, not sport hunters. Sinnott’s story also makes it clear that there’s been no upsurge in moose at Kincaid. In fact, based on F&G studies, it’s more likely moose numbers have dropped since the mid-1990s. Nor is there any evidence that moose have become more aggressive. Based on my own experiences—I visit Kincaid many times throughout the year—I’d wager Kincaid moose are as habituated to people as they’ve ever been, if not more so. . . .
Those trails have greatly fragmented what remained of Kincaid’s already diminished woodlands. Thus it’s now harder for moose to avoid us humans and that in turn means more encounters. More conflicts. Those who say we must have either a moose preserve or a moose hunt are creating a false choice. We can have both moose and human recreation. But people need to take more responsibility for their actions, they need to pay more attention to—and show tolerance for—our wildlife neighbors. To its credit, the Board of Game refused to take action on the proposal, arguing it had no authority to make such a decision. Future attempts to open Anchorage to moose hunts seem inevitable, especially as increased recreational use and fragmented habitat heighten the likelihood of moose-human encounters and conflicts. The question—even in outdoors- and wildlife-loving Alaska—is whether we humans, again, supposedly the more intelligent species, are willing to make the smart decisions and compromises necessary to harmoniously share the landscape with moose—or bears, or other wild species. 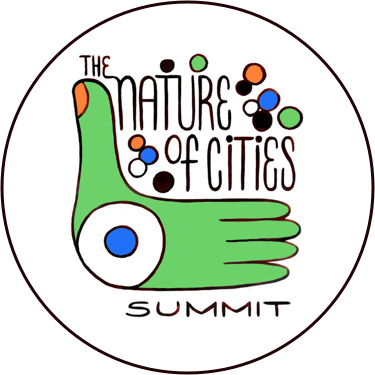 On the surface, the challenges may appear larger when dealing with sometimes agitated—or traffic ignorant—thousand-pound animals, but the question of how to weave our urban lives with wild nature is one faced in different forms all around the world. Moose simply make the challenges more obvious. Nice informative and interesting writing, Bill. I have thoroughly enjoyed the 4 moose encounters (3 at one time in the parking lot of the elementary school across the road from where I live) ( 1 moose along the side of Debarr Road which eventually was killed in traffic-I grieved that one) and (one huge moose in the yard munching on all the bushes where I was housesitting in South Anchorage) I have had since I moved here to Anchorage a year ago.